One of the biggest adjustments that I had to make when coming to the United States was related with food. Not only is a lot of the food here different than what I was used to, but the whole meal schedule was different too! In Mexico, breakfast is usually the biggest meal of the day. There are so many great breakfast foods in Mexico – like chilaquiles, huevos rancheros, and more! So when I found out that a common breakfast for my husband consisted of cold cereal and orange juice, I was a little bit surprised! I always loved breakfast growing up, because I always felt like it gave me a great start to my day and provided me with the energy that I needed to go out and play with all of my friends and helped my imagination to shine! 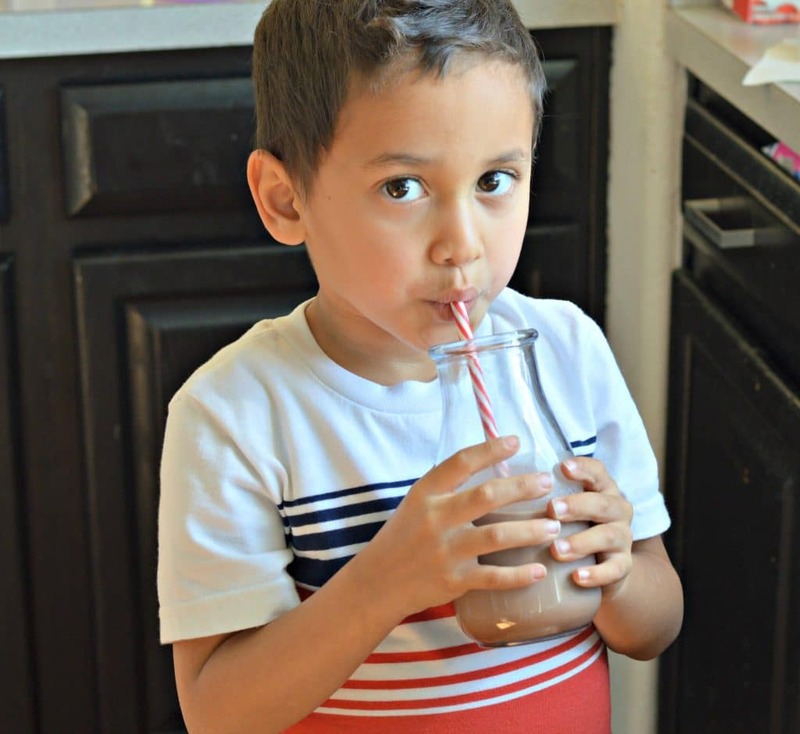 Although I have adjusted to the common meal schedule here in the United States, one thing that I have tried to maintain is having good, nutritious breakfasts that my two little boys actually enjoy eating. 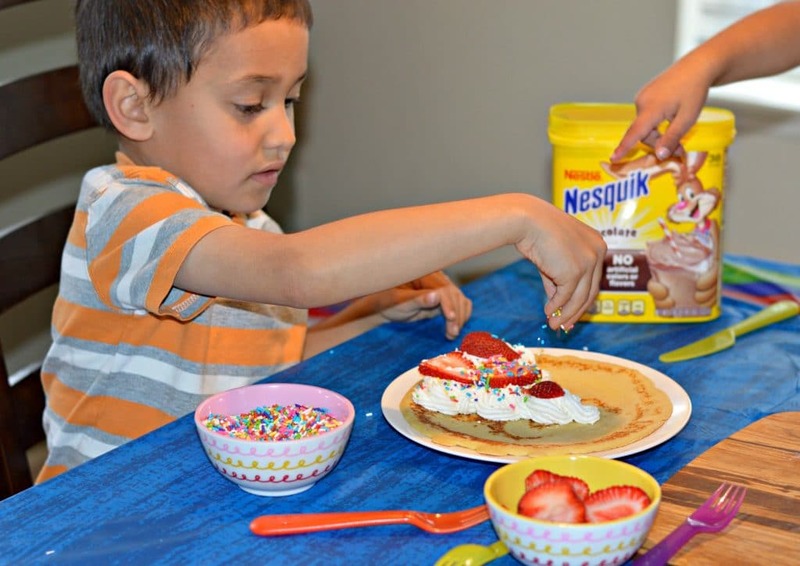 One of their favorite breakfasts is definitely these Sweet Breakfast Crepes – they are so delicious and I always make it a point to have lots of different ingredients for them to add to their crepes so that their imagination can run wild! 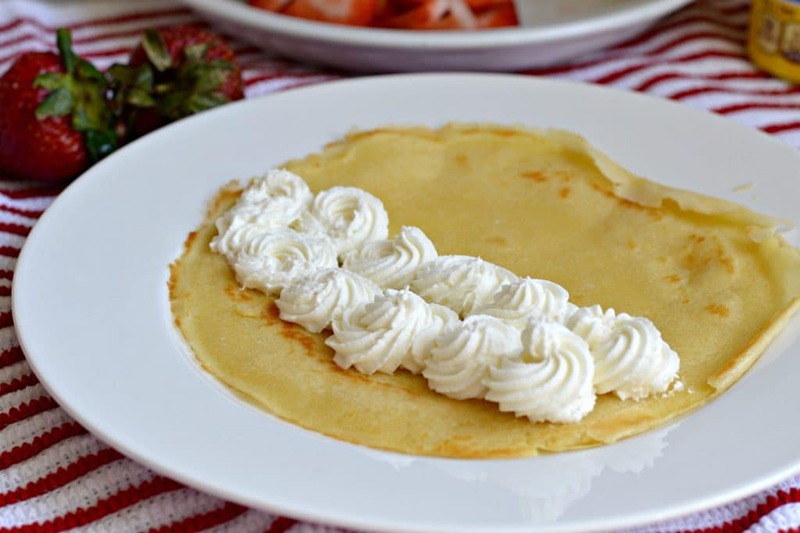 Today I made these tasty crepes for my boys and let them decide between a few different options – they ended up with strawberries, chocolate syrup, a delicious homemade white chocolate whipped cream (recipe below), and sprinkles. As you can see, they really enjoyed this breakfast. Of course I had to accompany it with a refreshing Nestle Nesquik breakfast shake – consisting of Nestle Nesquik Chocolate Powder, cold delicious milk, a small amount of extra sugar, and a couple of pieces of ice. This is the perfect complement to any breakfast, and my boys are ALWAYS asking for it! 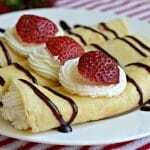 One of the great things about this crepes recipe is that it only requires a few ingredients and can be made quickly on those mornings that you are rushing to get everything ready. My boys are always so excited every time that I make it because they know that they are going to get some delicious and fun fillings and they love choosing their own. I love to see their imagination run wild, and I love teaching them the importance of having a delicious breakfast every morning! 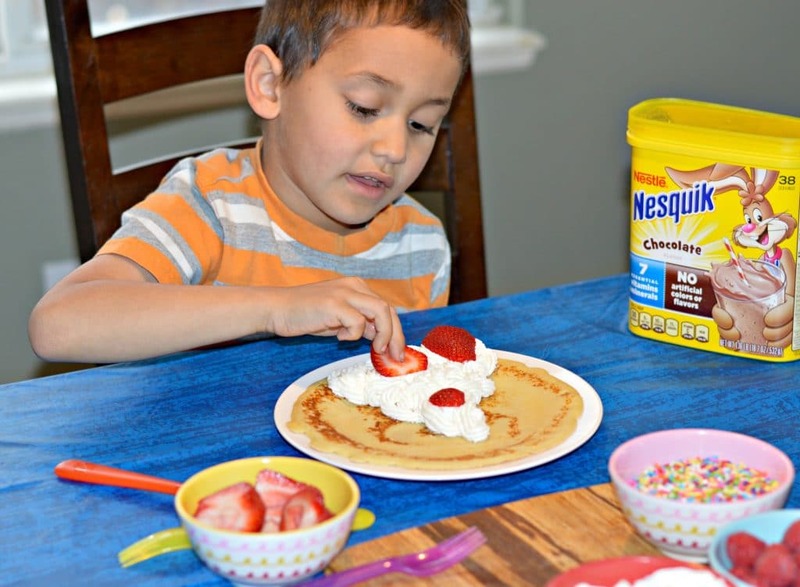 If you like this recipe, then head on over to the Nesquik Pinterest board for many more great ideas! Combine and beat together all of the ingredients and refrigerate for 30-60 minutes. Add enough batter to coat and fill the bottom of the pan (move it around from side to side). 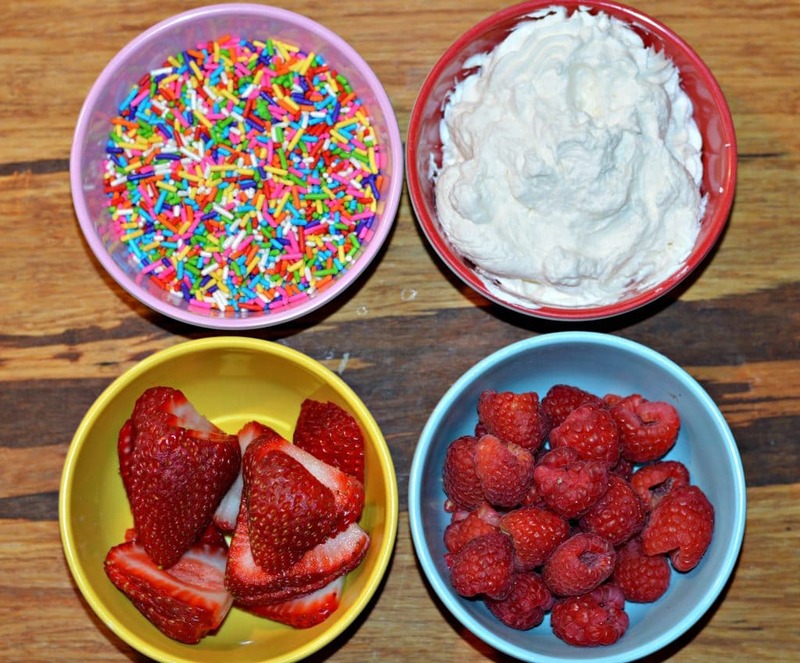 Combine all of the ingredients in a cold mixing bowl and beat on high with cold beaters until light and fluffy. 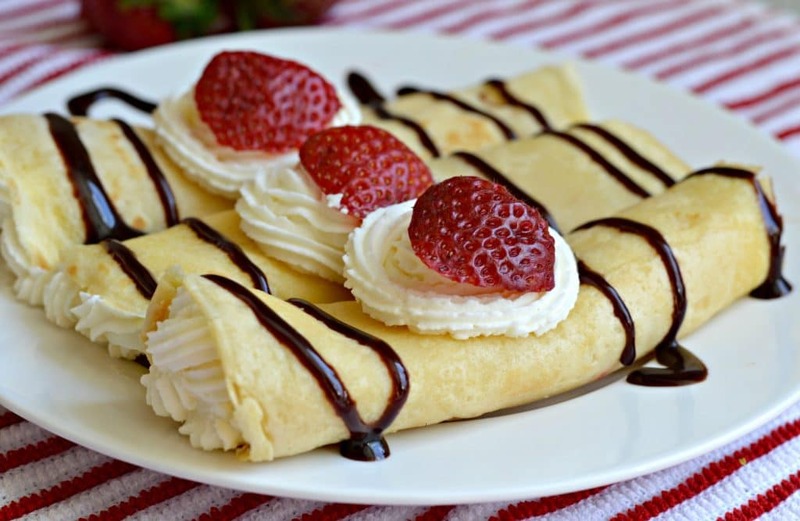 Serve with crepes and refrigerate leftovers. I LOVE Breakfast! 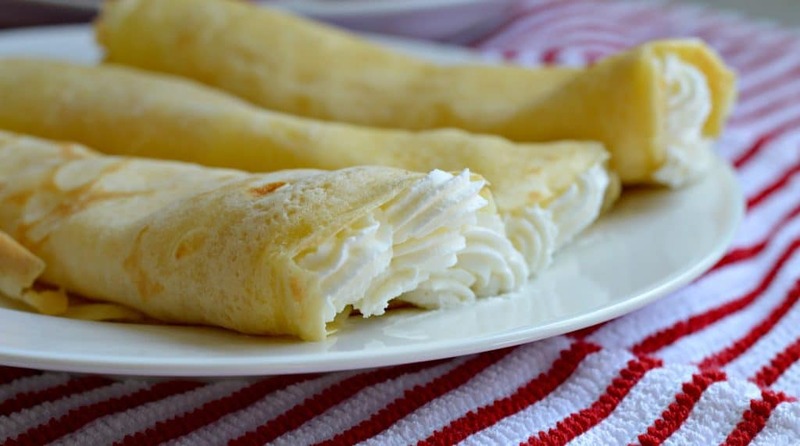 I cannot tell you how delicious these White Chocolate Whipped Cream Crepes sound to me. YUM!! You’re welcome! I am a huge fan of breakfast too 🙂 I hope you enjoy them. Oh boy, these look fantastic. I’m going to make them for sure. I know what you mean about the different foods and meal schedules. We’ve live all over the world and I always feel that meals in the U.S. are so rushed. Plus, I hate all of the processed food in the U.S. I haven’t had crepes in ages. These look delicious! Wowzeee, that looks so delicious! will you be my mom? haha! These look delicious and definitely a great start to the day!